The new, “survivors” issue of the satirical magazine Charlie Hebdo has triggered outrage from Muslim communities all over the world, with worshipers staging protests all week. More are set to take place after traditional Friday prayers. Pakistani police fired tear gas and used water cannons on protesters in Karachi, with AFP photo journalist injured in the protests. Earlier on, dozens of Pakistani lawmakers marched near the country’s parliament in Islamabad, calling for "death to blasphemers." "All political parties are with us… All Muslim countries should condemn these blasphemous cartoons," Pakistani Religious Affairs Minister Sardar Yousaf said, NBC reported. The Muslim brotherhood in Jordan is preparing to rally in Amman, with spokesman Murad Adaileh saying the group strongly condemned both the killings and the “offensive” against the prophet, AP reported. Egypt’s top religious institution, the Al Azhar mosque, has expressed its outrage at the magazine’s new cartoon, describing it as a “blatant challenge to the feelings of Muslims who had sympathized with this newspaper,” AP reported. Muslims in Aleppo on Thursday marched through the southwestern Syrian city, burning a “Je suis Charlie” poster. "Mohammed is our leader for ever. 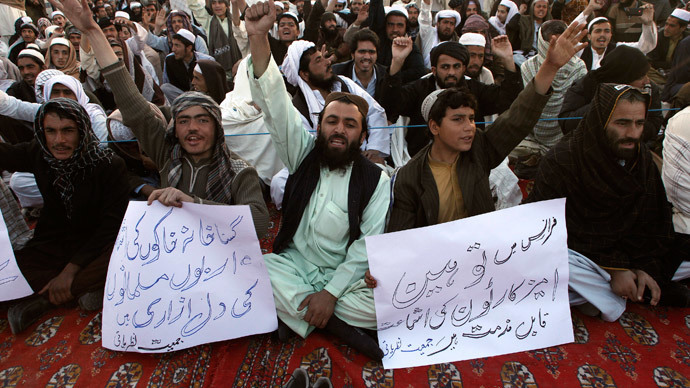 We will sacrifice ourselves for you, God's prophet," protesters chanted. "We are on the street today to support our prophet and to protest against the offensive drawings that Western governments are spreading, while hurting Muslims' feelings all over the world," demonstrator Abu Mudar told AFP. "These drawings increase enmity, hatred and feelings of hostility among Muslims toward these governments and these countries," he said. Protesters in the Philippines marched in the southern town of Marawi, burning images of the magazine’s new cover. Organizers stated that “freedom of expression does not extend to insulting the noble and the greatest prophet of Allah,” The Guardian reported. Turkey was among the few Muslim-majority nations where some media outlets published Charlie Hebdo images, while omitting caricatures that might offend the Muslim population. 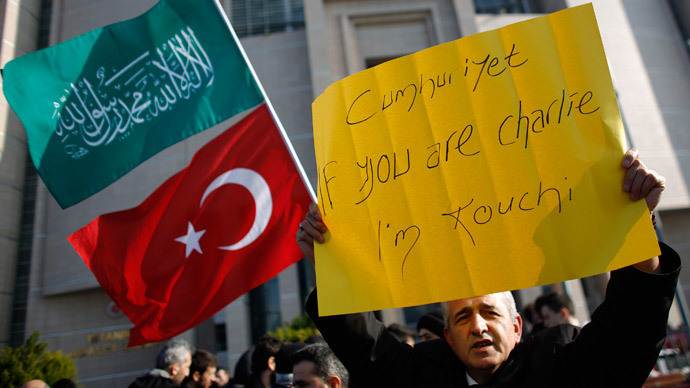 However, Turks are split over the publication, with a group of pro-Islamist students organizing a rally outside Cumhuriyet’s office in Ankara, the state-run Anadolu Agency reported. Security was stepped up outside the newspaper’s headquarters and printing center. Across Europe, Muslims also protested against the cartoon: for instance, a group of leading UK imams called on worshipers to show their “justified displeasure at the mockery that is made of our faith,” but in a peaceful manner.